In a previous Travel post, I discussed detailed information about the history and the architecture of St. George’s Chapel located in the Lower Ward at Windsor Castle. 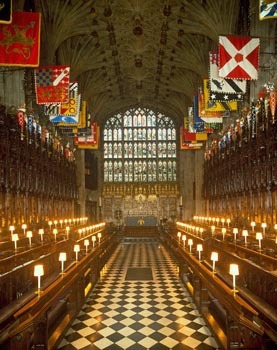 St. George’s Chapel is dedicated to St. George, the patron saint of the Order of the Garter. The Chapel is where the traditional Garter Ceremony takes place annually in mid-June, the first Monday of Ascot week which has become known as Garter Day. 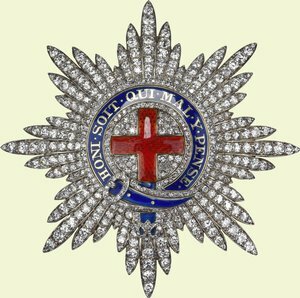 In this post, I will start with the history of the Order of the Garter and then more detailed information about the Garter Ceremony and finally a description of the distinctive vestments and accessories wore by the Knights of the Order and the elaborate decorations within the Knights stalls in St. George’s Chapel. 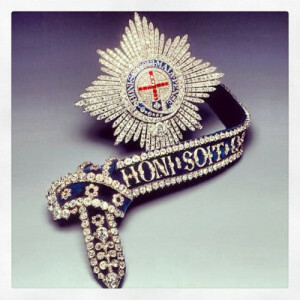 The Most Noble Order of the Garter was first established by King Edward III in 1348 (historical records could possibly indicate that the order was founded four years earlier) and is the oldest and the highest British order of chivalry. The Order is considered the third most prestigious honor to receive; the other two are the Victoria Cross and the George Cross. From the time the Order was first established and for almost two centuries thereafter the Sovereign and the Knights of the Garter would annually gather for three days at Windsor Castle and in particular St. George’s Chapel. Then, from 1674 to 1805, the Order began to gather for a short amount of time and the ceremony and celebrations were drastically limited to a one day event. Eventually, the venue was changed from Windsor Castle to London and the members only gathered for the investitures. Then in 1948, King George VI requested that the Knights of the Order would once again formally gather annually at Windsor Castle followed by a religious service at St. George’s Chapel. Throughout the previous centuries, the government had advised the selection of the Order’s members but King George VI implemented that the Sovereign would personally select any additional members. 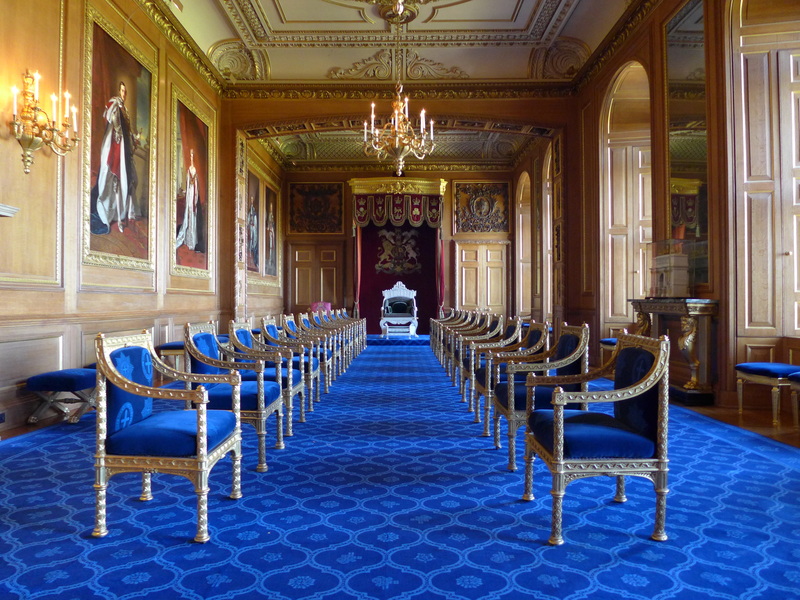 Previously, members of the Garter were exclusively limited to the British aristocracy but today the Garter Knights have been drawn from members of the British Royal Family, former Prime Ministers of the British government or foreign Monarchs. 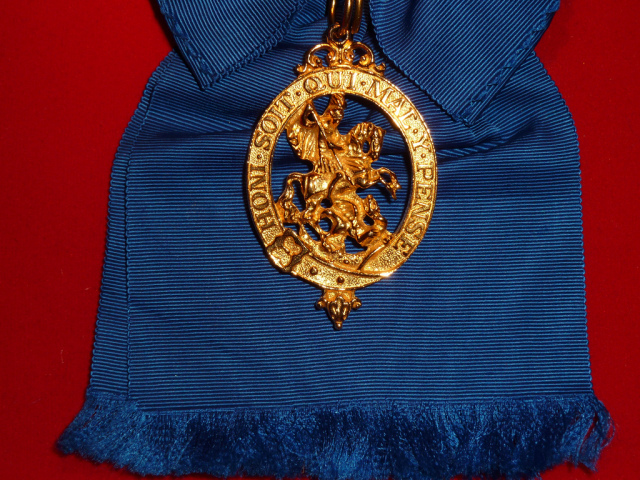 Currently the membership of the Order is limited to the Sovereign, the Prince of Wales and 24 additional members. 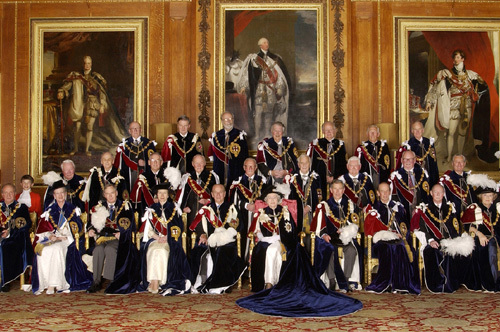 Historical Note: Over the past centuries, a few Garter Knights have been degraded in status or removed from the order. One important reason would this would have occurred was when a Knight committed treason against the Sovereign. Between 1387 and 1716 there were over twenty Knights removed although six of those were later reinstated. During World War II, Emperor Hirohito of Japan and King Emmanuel III of Italy’s banner, crests and swords were removed from St. George’s Chapel. In 1945, when Winston Churchill was voted out of the Conservative party, was offered the position as Knight of the Order for the first time and famously refused. Later, he stated “I cannot accept the Order of the Garter from the King (George VI) after the British people have given me the Order of the Boot”!! Then in 1953, Queen Elizabeth II offered him the position again he graciously accepted and became a Knight of the Order of the Garter. After the investiture ceremony, a long procession led by the Constable and Governor of Windsor Castle, followed by the Military Guards of Windsor and the Queen with the Knights of the Order of the Garter walk from the Upper Ward of Windsor Castle to the Lower Ward and St. George’s Chapel for a religious service of thanksgiving and the installation of any members. 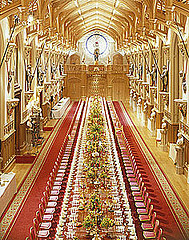 Afterwards, the current Queen Elizabeth and the Duke of Edinburgh host a luncheon for the Knights of the Order. The distinctive symbol of the order is a dark blue garter with the motto “Honi soit qui mal y pense” (“shame on him who thinks evil of it”) written in gold lettering. The origin of the garter used in connection with the Order could be a reference to the small piece of cloth was used to attach the armor of the knights and it makes perfect sense that the organization used the symbol of the garter to represent the Knights of the Order bond together. 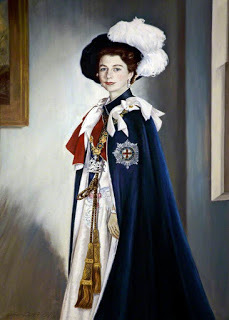 The Knights customarily wear the garter attached beneath the left knee and the Ladies of the Order wear it below their left elbow but in either case the garter is wore infrequently except for formal occasions and ceremonies. The material used for the garter can vary from blue velvet trimmed in diamonds or blue silk embroidered in gold. The Queen rarely used the Garter and over the years two notable exceptions have occurred when she wore it on her visits to the Vatican in 1961 and 1980. The Knights of the Order of the Garter have been wearing a robe or mantle (a loose-fitting cloak) in some form or fashion for centuries. Originally the cloth used for the mantle was wool and the color was purple but over the years it has changed and the current material is dark blue velvet lined with white taffeta. The mantles used by the Sovereign (Queen Elizabeth II) and those of the Prince of Wales and other Royal Knights and Ladies are different in the fact that their mantles end with a train. On the left breast of the Knight’s mantle is the heraldic shield of St. George’s Cross which is encircled by the Garter, the Queen’s mantle has the Garter Star of the Order. On the right shoulder is a dark red velvet hood and surcoat (an outer garment most commonly worn during in the Middle Ages). The mantle has elaborate cords used for closure with white ribbons at the shoulders and the Garter Collar with the Great George pendant is pinned and drapes across the front. Worn with the mantle is the Garter Hat or Tudor Bonnet (a traditional soft crowned round brimmed cap). This unusual hat is made of black velvet and trimmed with the plume of white ostrich and black heron feathers. 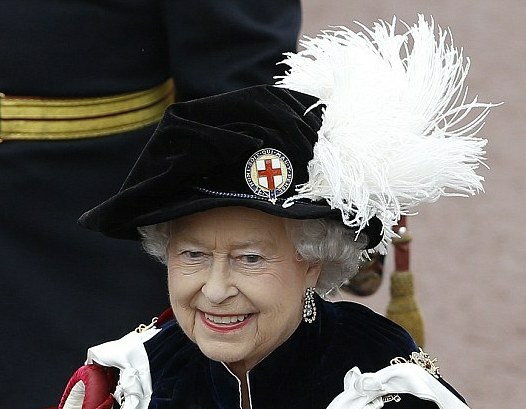 Attached to the hat is a badge of the heraldic shield of St. George which is encircled by the Garter of the Order. 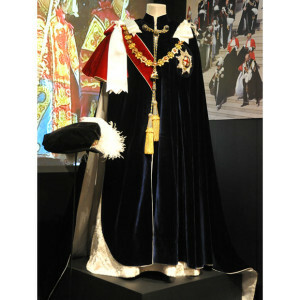 The Garter mantle and the hat are worn by the Knights of the Order only for ceremonial events such as the annual Garter Day service at St. George’s Chapel at Windsor Castle in mid-June. 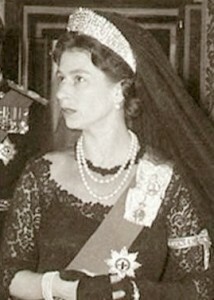 One exception when the Garter mantle and hat are worn is for formal portraits or photographs. The Collar worn by the Knights of the Order of the Garter dates back to the 15th century and today it is worn attached to the shoulders and draped across the front of the mantle. 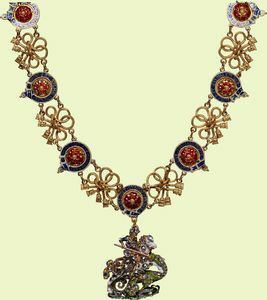 The Collar features alternating golden knots and red enameled Tudor rose encircled by the garter medallions joined together with gold links and attached to the Collar is the Great George pendant. The Garter Star is another item worn by the Knights of the Order and it is worn on the left breast. It was first included in the vestments of the Order in the 17th century under the reign of King Charles I. The Garter Star is an eight-point silver badge; each point is depicted as the rays of the sun with the four longer ones indicating the directional points of a compass. In the center of the Star is an enamel version of the Heraldic shield of St. George’s Cross which is encircled by the Garter of the Order. The Queen’s Garter Star was given to her as a gift from her father King George VI, in 1947 when she was invested into the Order. The Queen’s Garter Star is simply magnificent and is set with diamonds. The Garter Riband is a 4 inch wide sash which is customarily worn pinned from the left shoulder across the body to the right hip. The Riband was first included in the vestments in 17th century during the reign of King Charles I. Throughout the centuries the color has change from light blue to dark blue. The Lesser George is worn attached to the riband at the hip. Like the Greater George which is attached to the Garter Collar, it depicts St. George on his horse slaying the dragon but is much smaller in size and was flatter with fewer dimensions. Depending on the wearer, the Lesser George can vary in design with enameling and jewels. The Queen wears a more elaborate Lesser George which had originally belonged to King George IV and was later given by Queen Victoria to her husband and Consort, Prince Albert. The Queen has also worn another Lesser George which depicts St. George in a cameo style badge which had originally belonged to her father, King George VI, and was also given to her upon her investiture. As previously mentioned in this post, the Order of the Garter hold investitures of new members and participate in a religious thanksgiving service at Windsor Castle and St. George’s Chapel annually in mid-June on Garter Day. 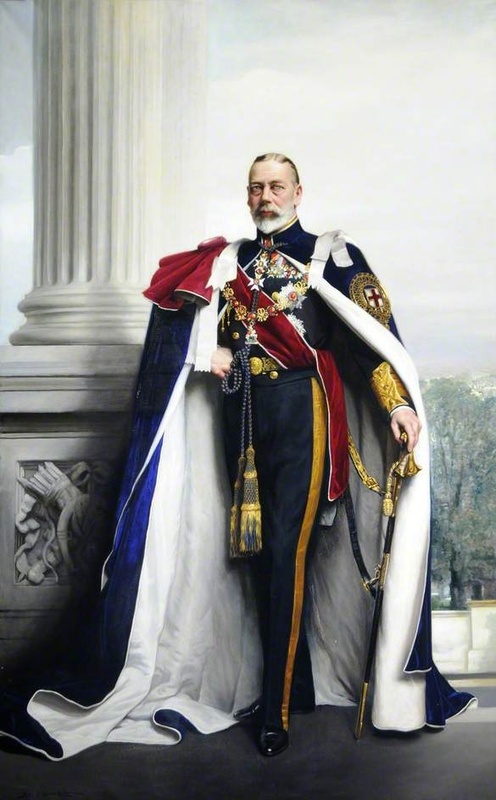 From 1805 to 1948, the Garter Services had been discontinued but it was eventually revised by King George VI and has since become one of those British ceremonies filled with pomp and circumstances. 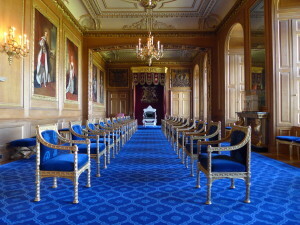 When there are new members that are being installed in the Order, they meet in the Garter Throne Room located in Windsor Castle in the morning. The Sovereign and Knights of the Order gather wearing the vestments and accessories of the Order. The newest member recites the Order of the Garter oath and then the Admonitions (an advice of counsel and warning) are given by a Church prelate or chancellor. The Knights items of the Order which have been placed on cushions in preparation for the investiture are presented to the Sovereign. The Sovereign, assisted by several Knights of the Order, ceremoniously gives the items to the newest member. The Garter is placed around the left leg of the new Knight, the Riband and the Lesser George are placed across their chest, and the Mantle and the Collar are also given at this time. 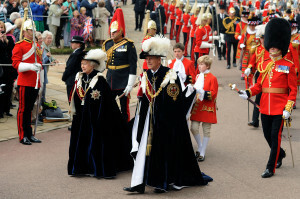 After the investiture ceremony, a long procession led by the Constable and Governor of Windsor Castle, followed by the Military Guards of Windsor and the Queen with the Knights of the Order of the Garter walk from the Windsor Castle to St. George’s Chapel for a religious service of thanksgiving. Military bands perform during the procession to the Chapel; one is positioned near the Henry VIII Gate and the second near the Henry VII Tower. The Royal Arms officers dressed in their black knee breaches start the possession. The next group is led by the newest Knight of the Garter that was just invested in Windsor Castle followed by the established and senior Knights. Then, the Knights and Ladies of the Royal Family, including the Prince of Wales and Prince William follow next. Next, the Queen and the Duke of Edinburgh are followed by a group of Yeoman of the Guards wearing their iconic Tudor uniforms. Finally, the procession arrives at the East Door of St. George’s Chapel and climb the grand steps and into the Nave. After the procession enters the Quire, the Knights take their place in their assigned stalls. The service of thanksgiving follows and upon completion, everyone returns to Windsor Castle by carriage or car. Then, Queen Elizabeth and the Duke of Edinburgh host a luncheon for the Knights of the Order in the Waterloo Chamber of the Castle. Each Order of the Garter Knight is assigned a stall in St. George’s Chapel and their name and coat of arms plate is affixed to the back wall of the stall. 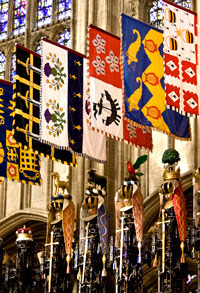 Hanging above the stall are the Knights heraldic banners, carved crowns or cornets or helmets and swords are displayed above the stall. 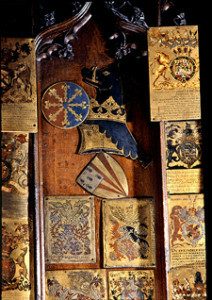 The items remain throughout the life of the Knight and upon their death the heraldic items are removed from the Chapel but the stall plate remains in place.